In to the Mountains The plains were drying up, and the powerful mountain tribes were getting ready to repulse, annihilate if necessary, those who entered their verdant land uninvited. Who will stop the brewing conflict, waiting for the smallest of sparks to set the world ablaze? King Bhagirath stared out of his palace balcony at the parched expanse of the land, stretching far into the horizon, contemplating choices that would save the doomed plains. Bhagirath the man must leave the security of his kingdom to tackle a crisis Bhagirath the King cannot. Thus begins a project of monumental proportions that will decide the fates of all the multitudes that dwell in those lands and the mountains: an attempt to bring Gangaa to the plains. As he enters the mysterious mountains alone, he crosses paths with friends and foes, finds aid and opposition. His travels takes him to the land of flesh-eaters, of the proud people of the mountains and beyond into lands unknown. Will he be able to persuade them to join him or will he carve out a path with fire and iron? 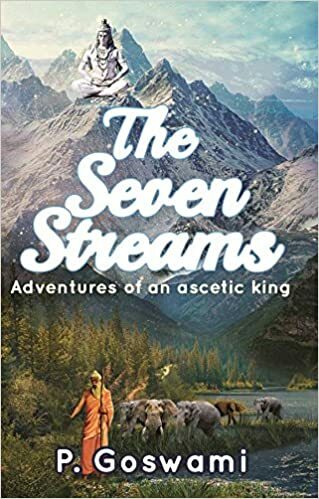 The first look of The Seven Streams is quite calming. The book cover is such that it invites the reader in. Now coming to the story line, the author has taken a story from Indian Mythology that many Indians would be aware of. But, he weaves it in such a way that it looks plausible. The story is king Bhagirath’s journey and the efforts that he takes to bring Gangaa to the Earth. Through the book, the reader knows that Bhagirath is set out to achieve the impossible, so we tend to flip the pages to know what is going to happen next! The pace of the story is perfect. There is a feel of adventure and the readers are constantly on their heels as to what is going to happen. The characters are all beautifully crafted. Even those who are not human i.e. the gods, the kiratas and many more have distinct traits and they behave accordingly. The best part of this book is the visual imagery. Reading this book feels as though the author is showing us a movie, the words jump out and form larger than life picture in the minds of its readers. Not just the characters, but the scene setting and overall narration made the overall reading of this book a pleasure. This book is an interesting mix of action, adventure, science fiction, and mythology. If you like any of these genres, be sure to pick this one out. FREE PRINTABLES: Harry Potter Bookmarks!